After the Balkan Wars (1912-1913), the First World War (1914-1918) and especially after the Peace Treaties of Lausanne (1923), which gave the Macedonian issue a central place, there began a great ethnic cleansing of Macedonians, who in 1912 had numbered 374,000, from the Aegean part of Macedonia. Disregarding the principle of respect for minority rights within existing states, the negotiations in Lausanne accepted the principle of an obligatory resettlement of Christians from Turkey (Greeks, Turkophones, etc.) and of Moslems from Greece (Turks, Macedonian Moslems, etc.). Under the convention for obligatory emigration, 350,000 Moslems were expelled from Aegean Macedonia. 40,000 of these were Macedonian Moslems. In place of the Macedonians expelled to Bulgaria and Turkey (a total of 126,000) the Greek state resettled 618,000 persons of Greek and non-Greek origin in Aegean Macedonia. This heterogeneous population, colonized in the Aegean part of Macedonia in the period between the two world wars, came from other parts of Greece, as well as from Asia Minor, the Black Sea region, the Caucasus, western Thrace, Bulgaria and other places. The large majority of the refugee Christian population was settled in villages throughout Aegean Macedonia, thus creating what has become known as the village, or agricultural, colonization; and a smaller number were colonized in towns, creating the so-called urban colonization. This large colonization effected by Greece resulted in a major change in the historical status of the Macedonian language. Once the language used by most, it was now afforded only the status of the language of a minority, or the status of a family language, which was spoken by 240,000 Macedonians. The large ethnic changes were the cause of changes in the status of the Greek language as well. From being the language of a minority, it now became the most used language, being imposed even on the Armenians, the "Turkophones", the in-comers from among the various Caucasian peoples, etc. With the imposition of the Greek language and with the help of mixed marriages, a new Greek nation was being created in Aegean Macedonia. The colonization by this population, whom the Macedonians called madziri (in-comers, foreigners), resulted in Aegean Macedonia losing its Macedonian ethnic character. The Macedonians (240,000) became a minority; they were present as a majority only in the western part of Aegean Macedonia (Kostur, Lerin and Voden regions). The large colonization brought about by the Greeks was followed by a law passed by the Greek government in 1926 on the change of the toponymy of Aegean Macedonia. 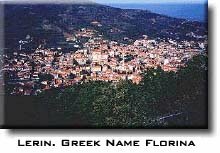 All villages, towns, rivers and mountains were renamed and given Greek names. The Greek state achieved this through a policy of state terror. 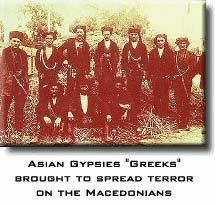 As early as the period of the Balkan War of 1913 Greece had begun the ethnic genocide of the Macedonian people. The cruelty displayed by the Greek soldiers in their dealings towards the Macedonian people was merciless. Following the political partition of Macedonia in 1913, Greece launched upon an active policy of the denial of the nationality and the assimilation of the Macedonians. The name Macedonian and the Macedonian language were prohibited and the Macedonians were referred to as Bulgarians, Slavophone Greeks or simply "endopes" (natives). At the same time, all the Macedonians were forced to change their names and surnames, the latter having to end in -is, -os or -poulos. With the denial of the Macedonian nation went the non-recognition of the Macedonian language. It was prohibited, its standing was minimized and it was considered a barbarian language, unworthy of a cultured and civilized citizen. Its use in personal communication, between parents and children, among villagers, at weddings and funerals, was strictly forbidden. Defiance of this ban produced Draconian measures, ranging from moral and mental maltreatment to a "language tax" on each Macedonian word that was uttered. The written use of Macedonian was also strictly prohibited, and Macedonian literacy was being eliminated from the churches, monuments and tombstones. 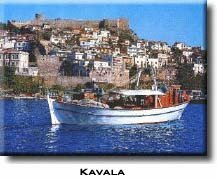 All the churches were given Greek names. The attacks on the Macedonian language culminated at the time of Ioannis Metaxas (1936). General Metaxas banned the use of Macedonian not only in everyday life in the villages, in the market-place, in ordinary and natural human communications and at funerals, but also within the family circle. Adult Macedonians, regardless of their age, were forced to attend what were known as evening schools and to learn "the melodious Greek language". The violation of the ban on the use of the Macedonian language in the villages, market-places or the closed circle of the family caused great numbers of Macedonians to be convicted and deported to desolate Greek islands. "The Famous Macedonian Parole - Solun (Thessaloniki) belongs to us"
"Abecedar - the primer for the Macedonian children in Aegean Macedonia, printed by order of the Greek authorities in 1925, in the Macedonian language with Latin letters (not with Cyrillic, as in the Macedonian alphabet), according to the decision of the Association of the Nations, immediately forbidden by the Greek authorities"
By signing the Treaty of Sevres on 10th August, 1920, the Greek government undertook certain obligations regarding "the protection of the non-Greek national minorities in Greece". Articles 7, 8 and 9 of this treaty stipulated precisely the free use of the minorities' language, education, religious practice, etc. Bulgaria and the Kingdom of the Serbs, Croats and Slovenes interested themselves in the implementation of this treaty, and when Greece realized it was in its interest to sign the "Lesser Protocols" (League of Nations, Geneva, 29th September 1924) on the protection of the Greek minority in Bulgaria and the reciprocal protection of the Bulgarian minority in Greece, Sofia launched a campaign in support of the activities initiated by the Joint Greek-Bulgarian Commission for the ,'voluntary" exchange of minorities. 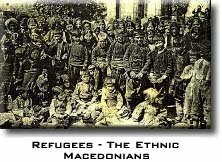 Large numbers of Macedonians were forcibly moved to Bulgaria, and Orthodox Christians from Turkey, Bulgaria and other places were brought to Aegean Macedonia where, as Greeks, they took over the Macedonians' property. However, since this met with resolute opposition not only in Sofia but in Belgrade as well, the Greek parliament did not ratify certain relevant clauses of the "Lesser Protocols". In March 1925 the Council of the League of Nations concerned itself with the situation so created and addressed three questions to the Greek government, insisting particularly on a reply on the measures taken with regards to the needs, the education and the freedom of religious practice of the "Slav speaking minority" in Greece. These documents treated the Macedonians neither as a Serbian nor as a Bulgarian minority, but as a "Slav-speaking minority". In its reply the Greek government categorically denied the Bulgarian government the right to be interested in the "Slav-speaking minority", claiming that only the League of Nations could have and had the right to intervene with regard to the rights of this minority. Greece stated that no steps were taken for the protection of the "Slav-speaking minority in Greece" as it had been thought that the convention on reciprocal resettlement would result in "the moving of all Macedonians" beyond the borders of Greece. The Greek government also notified the League of Nations that "measures were being taken towards the opening of schools with instruction in the Slav language in the following school year of 1925/26" and towards granting freedom to practice religion in the Slav language. 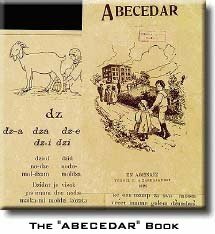 The primer intended for the Macedonian children in this part of Macedonia, entitled ABECEDAR, was offered as an argument in support of this statement. This primer, prepared by a special government commission and published by the Greek government in Athens in 1925, was written in the Lerin-Bitola vernacular (even though Bitola was not within the Greek borders!) but printed in a specially adapted Latin alphabet (instead of the traditional Cyrillic, which was the official alphabet of Bulgaria and Serbia). Many primers written mainly in Macedonian and intended for schools in Macedonia were published in the 19th century, but this was the first primer for Macedonians written and published by a legitimate government for its citizens and under the aegis of the League of Nations. This significant act on the part of the Greek government was condemned outright by both Belgrade and Sofia. The former proved that those for whom the primer was intended were in fact "Serbs", whereas the latter claimed that they were "Bulgarians". Bulgaria commissioned its outstanding philologists and Slavists to help its diplomats and Belgrade inspired petitions from two ailari villages (written in Serbian!) which were sent to the League of Nations. These petitions stated that the signatories were "Serbs by nationality" and that they demanded their rights "as a national minority" and also a "Serbian school" in order to "protect their language from enforced Graecization". At the same time, propaganda activities were undertaken among the population of these villages, promising free land and Serbian priests and teachers to those who declared themselves as Serbs. The Greek government's immediate response was another petition from the same village (Birinci), signed 16th October 1925, in which the signatories claimed that "in this region there are no Serbs, nor are there any Serbian institutions, and consequently the Serbian language is not used". The League of Nations used this statement to ask, in writing, the following question: the Greek government claims that this population does not speak Serbian, but does not say "what the language they speak in is". At the last moment before the deadline the Greek government replied by cable saying that "the population of these villages knows neither the Serbian nor the Bulgarian language and speaks nothing but a Slav-Macedonian idiom". Thus the Greek government officially recognized for the first time the separate national entity of the Macedonians within Greece's borders, which is also clearly confirmed by the pure language of the pnmer, ABECEDAR, published in Greece. Following the stormy and violent reaction in the press of the three monarchies the Greek government decided, with relief, not to introduce the primer, which was already published, into Macedonian schools. Change of Toponym. Immediately after the Bucharest Peace Treaty, when it became quite clear that Greece had usurped territory which did not belong to it either by the ethnic structure of the population or geographically, the Greek government conducted a census of the population in the new lands. According to this census Aegean Macedonia numbered 1,160,477 inhabitants. In 1917'the law known under the number 1051 was passed, article 6 of which established the formation and functioning of the town and village municipalities of the New Lands. On 10th October 1919 the Commission on Toponym in Greece issued a circular letter which contained instructions for the choice of place-names. The circular letter from the Commission was immediately followed by a booklet by N. Politis entitled "Advice on the Change of the Names of Municipalities and Villages" (Athens, 1920), published by the Ministry of Internal Affairs of Greece. 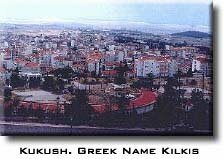 At the same time, special sub-commissions were formed in the newly-established districts in Aegean Macedonia, whose task it was to study the problem on the spot and to suggest new names for the villages and towns in the respective districts. In the spirit of this letter, in 1922, the Commission on Toponyms of Greece issued a more detailed statement under the number 426. This Commission had intensified its activities and was now giving concrete suggestions. However, owing to the Graeco-Turkish War, the still undefined peace agreement with Turkey and also the great migrations of the population between Aegean Macedonia and Turkey and the forced movement of an estimated 33,000 Macedonians to Bulgaria (imposed by the Neuilly Convention, signed by Bulgaria and Greece, for "voluntary" resettlement) the process of renaming was slightly slowed down. Thus in the period from 1918 to 1925 inclusive, 76 centres of population in Aegean Macedonia were renamed: in 1918 - one; in 1919 - two; in 1920 - two; in 1921 - two; in 1922 - eighteen; in 1923 - eighteen; in t924 - six and in 1925 - twenty-six. But as soon as the processes of migration came to an end and the position of the state was strengthened, and, following the legislative orders of 17th September 1926, published in the "Government Gazette" N2 331, 21st September 1926, and the Decision of the Ministerial Council dated 10th November 1927, and published in the Government Gazette S2 287, 13th November 1927, the process of renaming the inhabited places was accelerated to an incredible degree. Consequently, in the course of 1926, 440 places in Aegean Macedonia were renamed: 149 in 1927, 835 and-in 1928, 212, i.e. 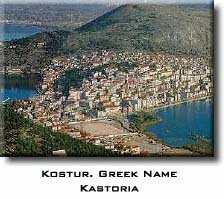 in only three years , 1926, 1927 and 1928, 1,497 places in Aegean Macedonia were renamed. By the end of 1928 most of the centres of population in Aegean Macedonia had been given new names, but the Greek state continued the process by a gradual perfection of the system of renaming, effected through new laws and new instructions. On t3th March 1929 the special law known under its number, 4,096, was passed and published in the "Government Gazette" S-- 99 of 13th March 1929. This law contained detailed instructions and directives as to the process of renaming places. By the force of this law and the earlier instructions, amended by Law Ng 6,429 of 18th June 1935, Law S2 1418 of 22 November 1938, Law N2 697 of 4th December 1945 and many other instructions, legislative orders and other enactments, the process of renaming the inhabited areas has been carried on to this day, taking care of each and every geographical name of suspicious origin throughout Macedonia, including entirely insignificant places, all aimed at erasing any possible Slav trace from Aegean Macedonia and from the whole of Greece. With these laws, instructions and other enactments, the district commissions in charge of the change of place names and the Principal Commission at the Ministerial Council of Greece (established as early as 1909) enforced many more changes. 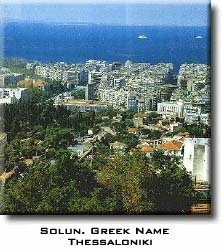 In the period from 1929 to 1940 inclusive, another 39 places in Aegean Macedonia were renamed, and after World War II (up to 1979 inclusive) yet another 135 places in this part of Macedonia were renamed. An estimated total of 1,666 cities, towns and villages were renamed in Aegean Macedonia in the period from 1918 to 1970 inclusive. This number does not include those inhabited places the renaming of which has not been announced in the "Government Gazette", which has been taken as the exclusive source for the figures and the dynamics of renaming given here by years and districts. Neither does it include the numerous Macedonian settlements named after saints, the names of which official Greece simply translated from the Macedonian into the Greek language. 27. Halkidiki - 40; or a total of 1,666. 1918 - 1; 1919 - 2; 1920 - 2; 1922 - 19; 1923 - 18; 1924 - 6; 1925 - 26; 1926 - 440; 1927 - 835; 1928 - 212; 1929 - 9; 1930 - 7; 1932 - 6 1933 - 2; 1934 5; 1936 - 2; 1939 - 2; 1940 - 6; 1946 - 1; 1948 - 2; 1949 - 5; 1950 - 17; 1951 - 4; 1953 - 22; 1954 - 18; 1955 - 25; 1956 - 4; 1957 - 3; 1958 - 2; 1959 - 2; 1960 - 5; 1961 - 6; 1962 - 3; 1963 - 6; 1964 - 3; 1965 - 4; 1966 - 1; 1968 - 1; 1970 - 1; or a total of 1,646. 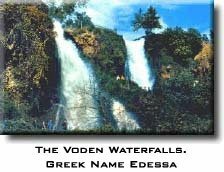 We shall give just a few examples of renamed places, rivers, mountains, rivers, lakes and mountains: The town of Voden was renamed Edessa; Rupista - Argos Orestikon; S'botska - Aridea; Postlo - Pella; Libanovo - Eginion; Larigovo - Arnea; ostrovo - Arnisa; Vrtikop - Skidra; Valovista - Sidirokastron, and the small settlements of Barbesh and Kutlesh into Vergina. The River Vardar was renamed Axios, the Bistrica - Alliakmon; the Galik - Erigon, etc. Lake ostrovsko became Limni Arnisis; Lake Gorchlivo became Pikrolimi, etc. Mt. Pijavica was renamed as Stratonikion; Grbovica on Mt. Athos Agion Oros; Karakamen - Vermion, Kusnica - Pangeon, etc. The Voden district became Nomos Pelis; Gumendze district - Eparhia Paeonis; Valovista district - Eparhia Sindikis; Zihnenska ditrict - Eparhia Philidos; Pravishka district - Eparhia Pangeu, etc. The Greek policy towards Macedonians in the course of the Second World War had a dual goal: to maintain the process of the assimilation and de-nationalization of Macedonians and the prevention of the creation and development of a Macedonian liberation movement with a Macedonian national programme in Aegean Macedonia. With this aim in mind, the Greek right wing formed a variety of nationalist and chauvinist organizations in Aegean Macedonia, such as the Protection of Northern Greece (I'VE), the Pan-Greek Liberation Organization (PAO) and others such, as well as a variety of military formations which persecuted the Macedonians, using terror, murder, Mass court proceedings, deportation, plundering, confiscation of property, clearances, resettlement, etc. In the given period 3,482 houses were burned down, 80 villages consisting of 1,605 families were plundered and 1,045 head of large live-stock and 23,382 head of small livestock were confiscated. In order to put the anti-Macedonian persecution on a legal basis the Greek authorities passed laws, decrees and other enactments by which Macedonians were subjected to large-scale persecution. We shall mention only a few such laws: Law N2 453 and Law TOD of July 1945 "on the securement of public safety"; Law 509/1945 "on public order and banditry"; Law 543/45 against organizations and individuals acting in favour of secession from the Greek territories", etc. The anti-Macedonian harshness of these laws surpassed the Compulsory Law S2 2366 of 7th September 1938, passed by Metaxas' regime and aimed at erasing every possible trace of the Macedonian national character of Aegean Macedonia. Under these laws Macedonian men and women, members of the Macedonian national democratic organizations, the National Liberation Front (NOF), the National Liberation Youth Association (NOMS) and the Antifascist Women's Front (AFZ) were proclaimed bandits. As soon as a person was proclaimed a bandit his or her next of kin and any other people who could be suspected of helping him or her were interned, in accordance with the regulations of these laws. Law 543/45 "against autonomist activity" helped rig thousands of charges against Macedonians accused of co-operation with Bulgaria and Yugoslavia in activities aimed at the secession of Aegean Macedonia and similar offences. Special commissions formed in every village or other populated place preferred mass charges against Macedonians to the District Attorney's office, with groundless accusations of collaboration with the occupier, autonomistic activities and the like. In the Kostur region alone 4,500 Macedonian men and women were accused of autonomistic activities, even though most of them were on active service with ELLAS. According to the information available, in the period from 1945 to the end of 1974 9,924 Macedonians were remanded in custody and 4,203 were convicted. 23,811 Macedonian men and women were interned on the basis of decisions of the special Security Commission. It was becoming clear that the Greek authorities were resolved to continue the oppression of the Macedonians, notwithstanding the cost, and thus to force them to flee across the border. The wave of refugees was growing daily. Under the pressure exerted by the Greek authorities entire villages fled across the borders. The most -typical examples of forced migration of Macedonians are to be found in eastern Macedonia, where Greek terrorist bands killed 29 and imprisoned 3,100 Macedonians and expelled 600 Macedonian families across the borders - and this in the period from February to the end of March 1945 alone. The situation was no different in the other areas of Aegean Macedonia. In 1948 the majority of the Macedonian population of western and central Aegean Macedonia fled to Yugoslavia and Albania in order to save their lives. More than 60,000 Macedonian men and women were forced to seek, refuge outside the country, fleeing across the border. As well as all these methods and measures, the Greek authorities attempted one of the greatest crimes against the Macedonians. In June 1946 a group of Greek Members of Parliament suggested that the Greek Parliament issue a decree for the forced deportation of all Macedonians from Aegean Macedonia, a suggestion which was justified by their alleged activities, which were said to be a threat to the integrity and sovereignty of Greece and a danger to the peace. In the period before the announcement of the suggestion and during the debate in Parliament a campaign of slander against Macedonians was carried out by the entire state and propaganda machinery, this being aimed at preparing domestic and international public opinion to regard the eventual implementation of this suggested action as completely justified. Thus Macedonians were described, among other things, as the "Sudetens of the Balkans and it was said that for as long as they were present in Greece they would represent a cause of war and a focus of war among the Balkan lands: or in other words, there would be no peace. For certain reasons both internal and external the Greek Parliament did not pass a decree on the exile of the Macedonians, but the Greek right wing clung to its policy on the exodus of the Macedonians. One of the Crimes committed by the Greek monarcho-fascists was the forced resettlement of their villagers and the dumping of them in special camps in urban centres, which had begun as early as 1946. According to the statistics, 213,000 people were forcibly exited from Aegean Macedonia. The terror, mass murder and other forms of repression proved ineffective when it came to breaking the spirit of Macedonians. Indeed, the Macedonian national liberation movement grew into an important and in certain periods even a decisive military and political factor in the country, one with clear and defined strategic goals. More than 20,000 Macedonians served in the ranks of the Democratic Army of Greece (DAG) and its auxiliary services. The liberated territory, covering mainly the territory of Aegean Macedonia, had popular rule, Macedonian people's schools, a Macedonian people's printing-house which published newspapers and other material in Macedonian, cultural and arts groups and other Macedonian institutions. Faced with the stand taken by the Macedonians the Greek authorities tried yet another cunning manoeuver. In order to shatter the unity of the Macedonian people and of the Macedonian Liberation Movement the Greek government passed, on 23rd May 1949, a strictly confidential decree by which the Macedonians, until then considered "Bulgarians", and other non-Greek elements which were to be uprooted, were renamed "Slavicised Greeks", and were to be treated as such by the Greek authorities: they were thus to be granted all civil rights, and included in all sectors of political and state life and the like. Their being called by the names Bulgarians or Slav Macedonians was strictly prohibited, and the name of "Slavophone Greek" was the only one permitted. The governmental agencies were instructed to adapt themselves and to help the Macedonians in every way possible to develop trust in the state and to seek its protection, so that they would begin to approach government representatives freely for the solution of their problems. This attempt on the part of the Greek right wing also proved to be a total failure. The decree had no effect on the Macedonians. They carried on with their struggle for national liberation and for the affirmation of their national identity with even greater intensity. As a result, the Greek authorities continued and even reinforced the violent repression of the Macedonians. On 20th January 1948 the Greek government passed the "M" Decree ordering the confiscation of the property of those individuals who had taken part in the Civil War on the side of the Communist Party of Greece (CPG) and NOF, and of those who had assisted these organizations and whose Greek citizenship had been revoked. In addition to this decree, the "N" Decree was passed on 2nd April 1948. This decree revoked the right of inheritance of all those who had taken part in or helped the Civil War. In view of the fact that large numbers of Macedonians had taken part in the Civil War, the consequences of this Decree and other regulations were borne mostly by them, but, after all, that was the main intention of the decrees. The implementation of these laws and decrees continued even after the Civil War had come to an end, for they were supported by enactments issued by the Ministerial Council of Greece: Nos. 944/1950; 253/1951; 826/ 1952. All these regulations were sanctioned by article 105, inserted into the Greek Constitution in 1952. The aim of this was to prevent Macedonia ns returning to their homes even after the end of the Civil War. Commissions for the confiscation and expropriation of refugees' property and for the allocation of this to new owners were formed in every district. The property confiscated and expropriated from the Macedonians was allotted to people loyal to the regime and to those who had distinguished themselves in the struggle against DAG and particularly against the Macedonians. Most of these people were brought in from the Greek hinterland. On 23rd February 1953 a meeting of the Greek military and administrative authorities in Macedonia was held in Thessaloniki at which it was decided to propose that the Greek government pass a law on the resettlement and re-inhabiting of the so-called sensitive border areas of Aegean Macedonia. it was suggested that all Macedonians from within 60 kilometers of the border be resettled, as disloyal elements, and that in their place Greeks loyal to the regime should be brought in as "healthy elements" with "pure Greek national awareness . The Greek government accepted this proposal and submitted it to the Greek Parliament which, on 4th August 1953, passed Law NL- 2536 on the resettlement of the population from the border areas. In accordance with the regulations of this law special state commissions were formed which effected the resettlement, selected people of pure Greek origin and established them in the Macedonian border areas, handing over to them the Macedonians, property. Among these people there were Greek nationalists, chauvinists and anti-Macedonians who had distinguished themselves in the struggle against NOF and DAG. A case in point, and not an isolated one, is that of the group of Macedonian villages called Janovenski in the Kostur region, the inhabitants of which had all fought in the ranks of ELLAS. Some of the inhabitants of these villages did not emigrate but were resettled in other parts of Macedonia. When the Civil War ended they requested to be allowed to return to their villages, but their request was turned down and their properties were pillaged and their homes demolished. The court proceedings for the return of their estates have lasted for decades. After the end of the Civil War the question of the confiscated properties became very strained. There were many new laws and regulations on the issue. The aim was to avoid returning the Macedonians' property, to prevent them from returning to their homes and thus to prevent the creation of conditions for the formation of a compact Macedonian population. All this was in the interest of the Graecization of Aegean Macedonia. The problem of the estates was taken care of in Regulations Nos. 3958 and 2951 of 1959, as well as in Law *- 4234, known as "Measures for Public Order", passed by K. Karamanlis's government in 1962, and by the 1972 decree No. 666. Under these regulations Macedonians were prevented from realizing their rights. An enormous number of applications for repatriation were turned down and those few who succeeded in returning could not have their estates back, which forced them to engage in marathon lawsuits which eventually ended to their disadvantage. In accordance with tradition, the Greek church took an active part in the anti-Macedonian campaign. Besides the daily sermons of anti-Slav and anti-Macedonian content preached by Greek priests, the Greek church took measures to force the Macedonians to give a collective and public oath that in future they would not use Macedonian but only the Greek language. In April 1980 the leadership of the Central Committee for Political Refugees (KEPPE) submitted a demand to the Greek government that political refugees be allowed freely and unconditionally to return to their homes. Minister Konstantinos Stephanopulos replied that the request could not be granted, because of national interests. In his explanation Stephanopulos stated that in certain parts of Greece there were areas in which there had lived and still lived people of a reduced national feeling, i.e. territories with a sensitive population composition, so that if a free repatriation of such people were to be allowed, Greece would have to face once again a national issue and danger in certain sensitive areas. Recent history had confirmed this, said Stephanopulos. He went on to offer a precise figure of 40,000 people residing in East European countries (Macedonians) and to say that this did not constitute an issue that concerned Greece. That this was out of the question so far as Greece was concerned. For these reasons, according to Stephanopulos, the Greek government could not accept or apply the principle of free repatriation. When the Pan-Greek Socialist Alliance (PASOK) assumed power, the government of Andreas Papandreou sharpened the measures towards assimilation and de-nationalization even further. On 30th December 1982 this government passed a law on the free repatriation of refugees from Greece, i.e. of those "Greek by birth", by which the Macedonians (as non-Greeks by birth) were deprived of the possibility of returning to their homes, to the country of their birth.